Only days after the passing of Civil Rights icon Maya Angelou, another elder, one of my personal heroines, Yuri Kochiyama, passed away yesterday at the age of 93. Rest in power, and thank you both for your legacy and inspiration. 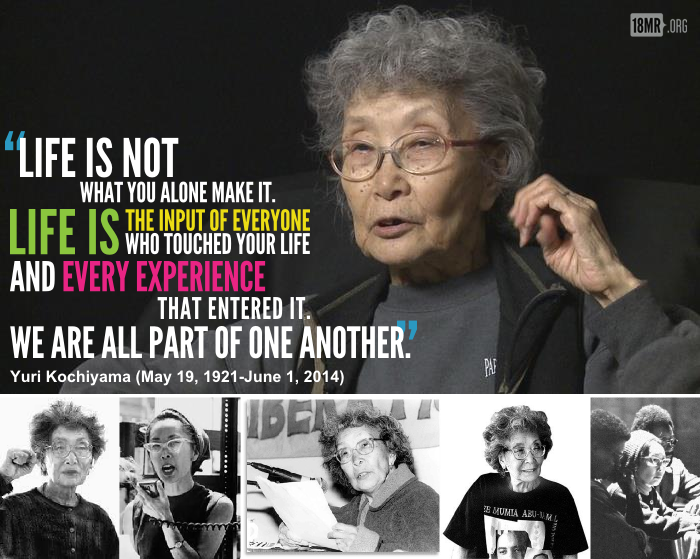 Yuri Kochiyama was a radical activist who believed, first and foremost, in energizing others towards action and activism. She was deeply troubled by social iniquity wherever she saw it, and she believed in finding common cause across any sociopolitical divide. She believed that all of us — including and particularly Asian Americans — had both the power and the duty to uplift ourselves and our fellow men and women towards the goal of racial and gender equality. Having lived personally through the U.S. prison camps for Japanese Americans during World War II and through the Jim Crow era, Kochiyama worked alongside and within the Civil Rights Movement and the Black Liberation movement. She was at the side of Malcolm X in his last moments.